I was very excited to receive this trunk. First let me say that the packaging and delivery of this item was Excellent!!! The description of the trunk is on point. It is well designed and crafted. Not too heavy and not too light. Perfect for the foot of the bed (I bought the bed also) and enough storage for a couple of blankets and a comforter or sheet sets or pillows, whatever you would like to store away. There’s no assembly needed. It is very sturdy and an absolutely beautiful item. 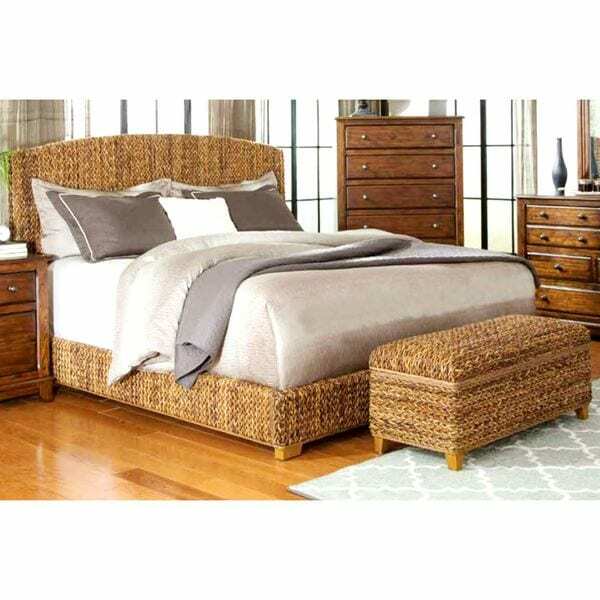 Bring a modern country style into your home with this unique looking woven bed. Constructed from solid wood in natural brown finish and wrapped with hand woven banana leaf upholstery. Its neutral tones blend admirably with lighter colors but also coordinate well with darker color schemes, making decorating a breeze. Welcome the attention that this robust, textured bed frame draws while sleeping comfortably on it for years to come. Available in Queen, King and California King sizes to match your room accommodations. Matching storage trunk available. Box spring required. Love my hand carved banana leaf bed! I know it sounds weird but this thing is beautiful. Solid material, easy to assemble. Doesn't make any noise, not even the head board. 😉 I've had bed and ottoman for about 8 months now. Very sturdy, banana leaves not falling apart or anything and the ottoman is well constructed with lots of space for storage. Little expensive but everyday I walk in my room and every morning when I wake up I feel a little like I'm on vacation. Love it ! Great quality and gives me the keywest feeling I wanted . "Would it work with just a deep pillow top mattress without using the box springs? (Asking for my mother who is only 5 ft. tall.)" This bed requires a box spring. "How high is the bed base from the floor?" "Will this work with an adjustable base?" The bed will not work with an adjustable base. It is meant to accommodate a standard boxspring and mattress set.